Despite my best intentions, starting 2019 out with doubling up on the "Weekly Haul" posting. Some planned changes/updates with logos and such also hasn’t happened yet for the blog, so rather than a hard break with the year, stuff’ll just roll out as it rolls out! Even this post’s "logo" above is not the final version, but I was messing with stuff the other day and decided I’d toss it up, whether it gets used just this once, or becomes a regular. If you’ve any thoughts on it, feel free to leave a comment! 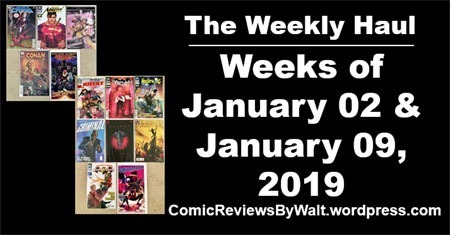 The first week of the year started out pretty small, with only a handful of issues. I don’t recall, nor do I care to check back, but I’m not sure if we had an issue of Heroes in Crisis in December, even–of course, this is only by a week, so negligible, but whatever. Much as I’ve liked this writer’s Batman stuff, I’m really not caring for this event…it doesn’t feel like anything’s really HAPPENING. Or not enough per issue. But 4 issues in, and it NOT being $4.99, nor has it slipped to some bi-monthly (or less-frequent) schedule, so I’m probably in for the entire thing at this point…if only to see what comes of it. It also seems that Action Comics slipped slightly…with #1001 having come out in July, January should see #1007. While it’s fitting that Marvel (in particular!) honor Stan Lee…it appears to me that they’re only doing so by removing the logos but keeping regular images for covers. To me, that just makes these look like DC variants, and since the cover images don’t incorporate his likeness in any way or such, and it’s not like they’re putting the black memorial band OVER a logo. And given his own large/over-the-top/grandiose-ness…it seems to me a disservice to hide the big, bold logos and such of the characters that directly or tangentially are here because of him. And Marvel sure wasted NO TIME rushing a ton of Conan stuff out. Much as they did four years ago with Star Wars. And frankly, that really puts me off quite a bit; as well as apparently having a couple more series debuting soon, and just…flooding the market. I opted to get this first issue just to try, but haven’t gotten around to reading it, and have yet to hear anything all that good about it. This week was definitely a bigger week with more stuff out…though it also annoyed me to a certain degree. Firstly, we get the premiere of the new Young Justice series with the new Young Justice #1. I quite enjoyed the issue, and look forward already to the next! This is a Batman week, with both Batman and Nightwing out. I need to catch up on READING Nightwing OR just cut my losses and drop the title. Time’ll tell on that. We’ve got the premiere of the new iteration of Brubaker and Phillips‘ Criminal title. I’ve enjoyed what I’ve read of this title in the past (and particularly remember the 10th anniversary issue!) so definitely giving this issue a shot…though I’ll likely trail off and wind up going with the collected editions. Again…time’ll tell. 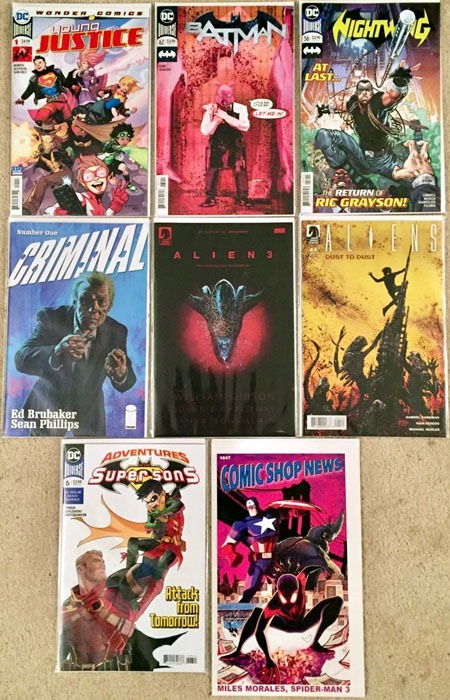 The week had TWO issues of Aliens stuff. 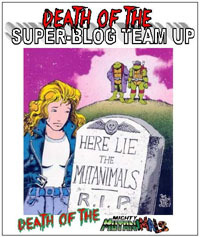 The conclusion of the 4-issue Dust to Dust mini. and the 3rd of (I believe) 4-issue adaptation of Gibson‘s screenplay for Alien3. I’m pretty sure I’ve wound up with variant covers for both series, just trying to get issues, and Dark Horse is back to the seemingly-rigid 4-issue cycles, so I’ve pretty much decided that for the multiple variant covers every issues and preferring the full(er) stories I’ll get the final issue of this Alien3 thing and then I’m done with the single issues. "Nostalgia" might prompt me to go against this if they do another Fire and Stone or Life and Death-style saga, but otherwise, at least collected volumes don’t USUALLY come with a bunch of variants! 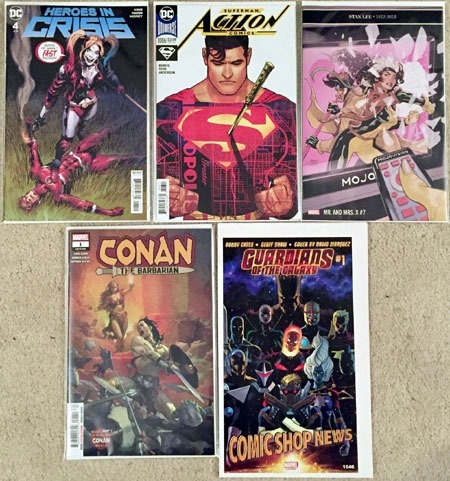 And finally, we’re halfway through Adventures of the Super Sons now, and I have got to get the previous series and all 6 of these pulled together to get caught up on my reading. I’m really looking forward to the new TMNT: Shredder in Hell mini that starts with the week of January 16th; as well as getting Bendis‘ "backstory" filled in on Jon Kent’s missing time between the end of the Rebirth stuff and his run (or the flashbacks, technically, from Bendis‘ Man of Steel). And depending on how the week shakes out, I may do a couple other posts soon for some other acquisitions of "stuff." As I’m repeating through this post, though…time will tell!